Anyone who's involved in the beauty world has a weakness (or two). My weakness is blush (and lipstick) and when I was perusing the aisles of Ulta recently and stumbled upon the new NYX baked blushes ($6.99 for .23 oz), I could not walk out of the store without at least one. I picked up two of the twelve magnificent shades; I grabbed Chiffon and Foreplay. These can be applied either wet, for more pigmentation, or dry. Upon first use, I noticed right away that there is a very rough exterior to the blush. Once you work your way through that tough top layer, you break through to a nice soft blush underneath. Just swirl a brush around on the top for a bit until you break through to the soft powder underneath. I thought these provided a pigmented wash of color, along with an illuminating dewy glow. Once applied, my cheeks looked radiant and glowing in a way I haven't had a blush do for me before. On the NYX website, Chiffon is described as an "iridescent highlight" and Foreplay is described as "pink with gold shimmer". I would say Chiffon is definitely more pigmented than "iridescent highlight" makes it sound. I was wearing it in my Justin Timberlake FOTD, for those of you curious to see how it looks on the face. These blushes provide a gorgeous wash of color that leaves the cheeks looking dewy and glowing without looking oily or greasy. I think the formulation that allows them to be applied either wet or dry is innovative, and makes for a very versatile blush. I really like these blushes, and how natural they look on my cheeks. I definitely want to pick up a couple more! 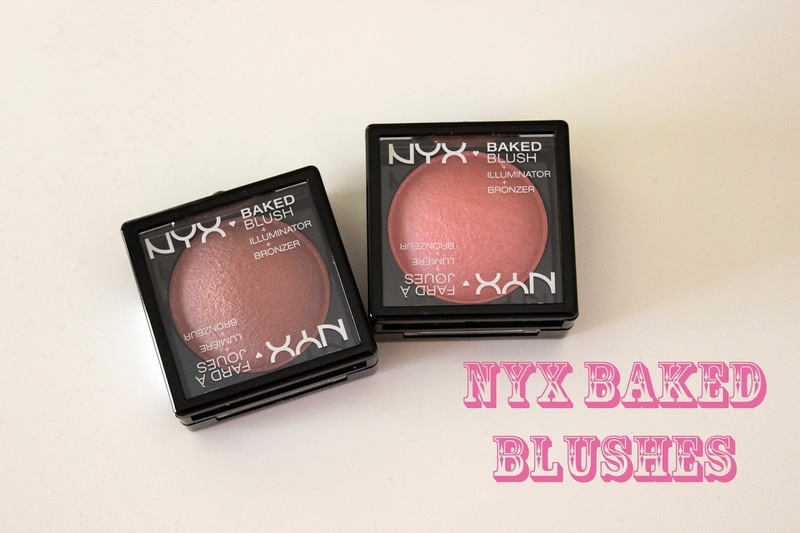 Have you tried the NYX Baked Blushes? Thanks for stopping by my blog, I love seeing your comments :) These blushes look really pretty and they compliment your skin tone very nicely for such a soft look. NYX is one of my favorite drug store brands but it isn't very easy to find here in Toronto. Thanks, Erica! What a shame NYX isn't more widely available in Canada! Thanks for reading! 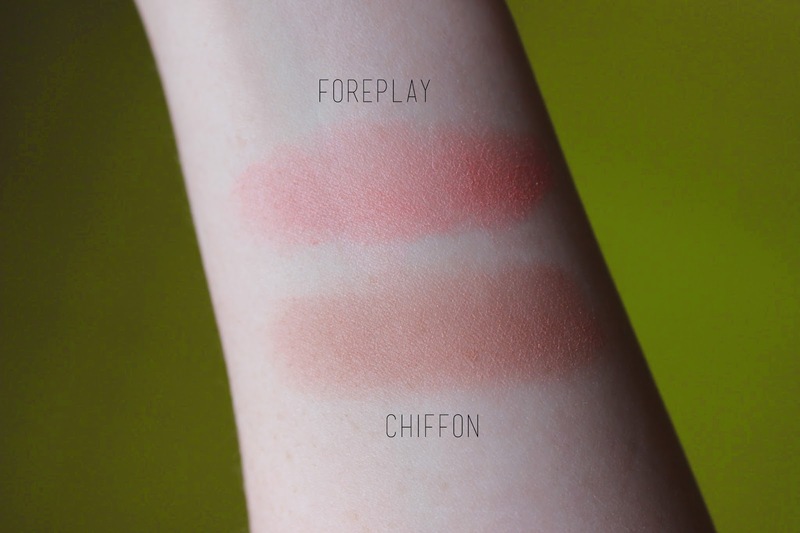 I love the colour of 'Foreplay', I just wish NYX blushes were more readily available in Canada, hah. I don't think I've ever applied wet blush to my cheeks, even with my baked shades. I always think cream blushes will disturb my foundation too! But somehow, it's always managed to look fine. That, or sometimes I'll slap concealer on the dark spots on my cheek, leave it unblended, go in with cream blush, and blend the whole thing together. That's a good suggestion! I'll have to try that! You know... cream blushes always end up okay for me, too... yet, I always pass them up because I don't want to deal with them. I'm going to make it a point to try to use them more! Wo these are absolutely stunning! Love love love! It's very pretty as a blush or bronzer! You know I never usually use blushes but I'm loving chiffon!! I need to get myself a blush soon. Do you know if they ship to the UK? They really are! Hope you can get your hands on them soon!